Two months ago, I visited Los Angeles in my capacity as Vice-President of the German Bundestag. 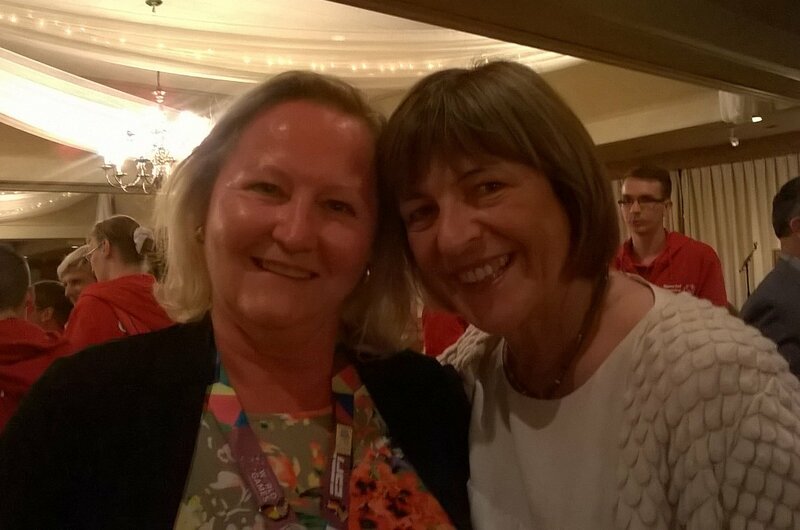 My trip was centered around the Special Olympics World Summer Games for people with intellectual disabilities, where we met in the context of your support for the German team. I also used the opportunity for political discussions and visits to local institutions on the issue of accessibility and inclusion. After all, it was in multicultural and open-minded California that the Independent Living Movement was born – a social movement working to ensure that people with disabilities can live independently. In addition, my program included bilateral visits to institutions within the scope of Germany’s foreign cultural and education policy, as well as meetings with the Jewish community in Los Angeles. After all, many people forced to leave Germany during the Nazi era found a new home here in California. 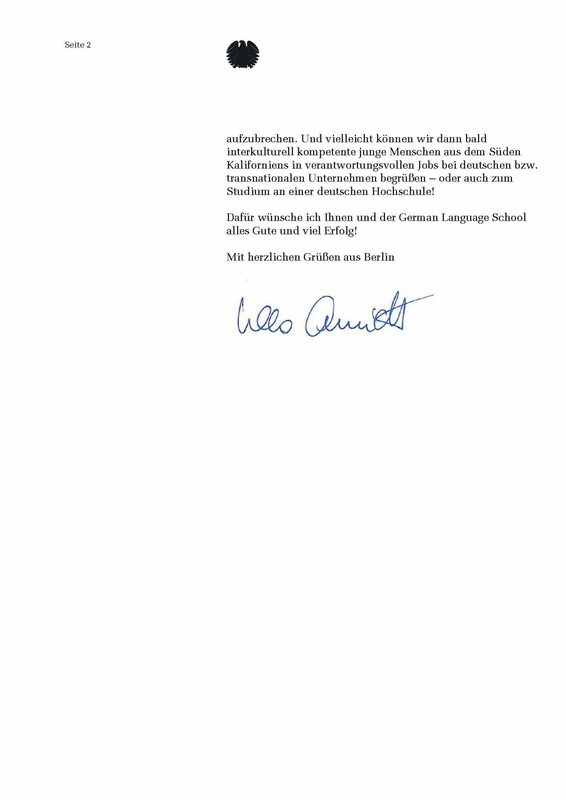 That is why I am particularly happy and grateful that interest in the German language –and thus also in Germany, its people and its culture – are once again on the rise in the region. You are now reacting to this by opening your German language school and you aim to get children and young people interested not only in the German language, but also in the wider cultural context. Your special concept of also speaking German outside the classroom, of learning in fun ways and by activating all the senses whilst taking part in watersports, fishing or hiking together represents a new departure. In addition, the beautiful location directly on the waterfront will undoubtedly make it easier for all those teaching and learning together in this location to look to the future and broaden their horizons. And perhaps, as a result, we will soon be able to welcome interculturally trained young people from southern California to responsible jobs at German or transnational companies – or as students at German universities! I wish you and the German Language School all the best and much success in this endeavor! youngest learners (four- to seven-year-olds). As a proponent of cross-disciplinary research, I value the focus on core curricula in German language, culture, and the humanities. My qualifications include Bachelor of Arts and Master of Arts in Modern Languages (French and German) from the University of Oxford, and a Postgraduate Certificate in Education (Language Specialism) from the University of Cambridge. In 1995, I was awarded a three-year full-time Research Scholarship to complete a doctoral study, ‘Foreign Languages in Early Schooling’. Singapore); international, educational and governmental agencies (England and France); knowledge and linguistic transfer in school settings (Germany and Spain); and notions of citizenship in early childhood (England and France). The administration, faculty members, parents, and (most importantly) the students form a community of practice – a family environment is fostered wherein children across the age-range learn and play together. 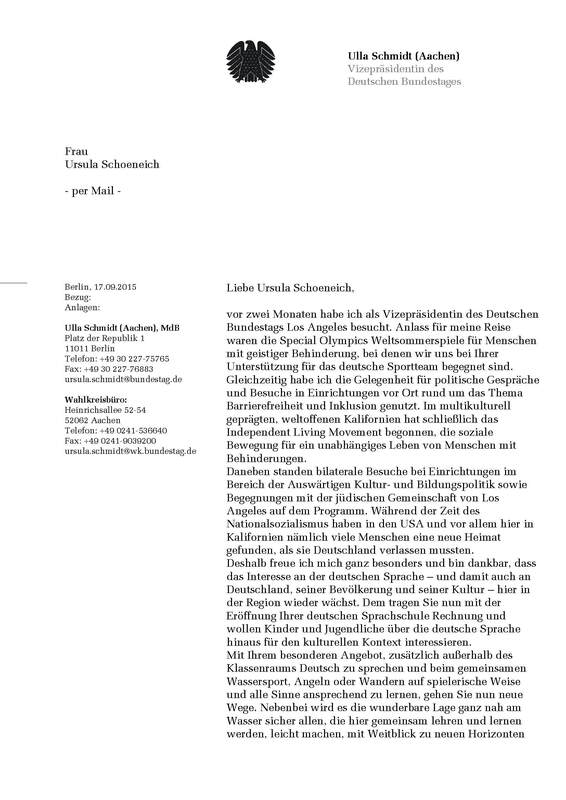 I fully support Frau Ursula Schoeneich in her application for accreditation of the German School Campus. Es ist mir eine Freude, den German School Campus in Südkalifornien (USA) zu unterstützen. Ich bin spezialisiert auf deutsche und französische Sprache und Literatur (Mittelalter bis Neuzeit) und habe ein grundlegendes Verständnis für Niederländisch und Italienisch. Im Jahr 2018 wurde ich als Dozentin auf dem German School Campus eingestellt, um die jüngsten Studenten (Vier- bis Siebenjährige) zu unterrichten. Als Befürworter der fachübergreifenden Forschung schätze ich den Fokus auf Kernlehrpläne in der deutschen Sprache, Kultur und den Geisteswissenschaften. Meine Qualifikationen umfassen Bachelor of Arts und Master of Arts in modernen Sprachen (Französisch und Deutsch) von der University of Oxford und ein Postgraduate Certificate in Education (Language Specialism) von der University of Cambridge. 1995 erhielt ich ein dreijähriges Vollzeitstipendium für die Promotion zum Thema “Fremdsprachen in der Grundschule”. kulturelles Bewusstsein (Niederlande / Hongkong); Lehrpläne für die ersten Jahre (Australien / Singapur); internationale, Bildungs- und Regierungsbehörden (England / Frankreich); Wissens- und Sprachtransfer in der Schule (Deutschland / Spanien); und Vorstellungen von Staatsbürgerschaft in der frühen Kindheit (England / Frankreich). Die Verwaltung, die Fakultätsmitglieder, die Eltern und (vor allem) die Schüler bilden eine Praxisgemeinschaft – ein familiäres Umfeld wird gefördert, in dem Kinder aller Altersgruppen gemeinsam lernen und spielen. Ich unterstütze Frau Ursula Schoeneich voll und ganz bei ihrem Antrag auf Akkreditierung des German School Campus.